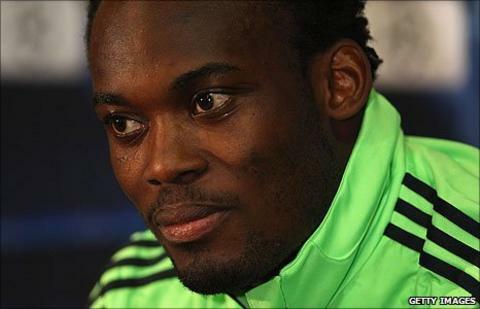 Chelsea midfielder Michael Essien has been ruled out for six months after a knee operation. The Ghana international, 28, ruptured his anterior cruciate ligament and meniscus during pre-season training, and underwent "successful" surgery. Chelsea manager Andre Villas-Boas told the club website: "Everyone wishes Michael well for his recovery. "His team-mates and all the staff and I look forward to helping him return to playing as soon as possible." Essien was ruled out for more than six months in 2008 when he sustained cruciate ligament damage. He also missed the 2010 World Cup because of a knee problem. The midfielder's latest setback is a blow to Villas-Boas, who is preparing his squad for their trip to the Far East, where they will compete in the Asia Cup. Essien joined the Blues from French club Lyon in 2005 in a £24.4m deal and has gone on to establish himself as a key player at Stamford Bridge. He has helped Chelsea to two Premier League titles and three FA Cups, as well as the Carling Cup in 2007. Despite being ruled out for the majority of the 2008/09 campaign, Essien has amassed 229 appearances, scoring 26 goals.